Producing graphics cards since 1997, PowerColor has always been actively involved in bringing two ingredients to the table – innovation and creativity. The DEVIL series in particular has been representative of the very best the company offers, fusing together both performance and efficiency. 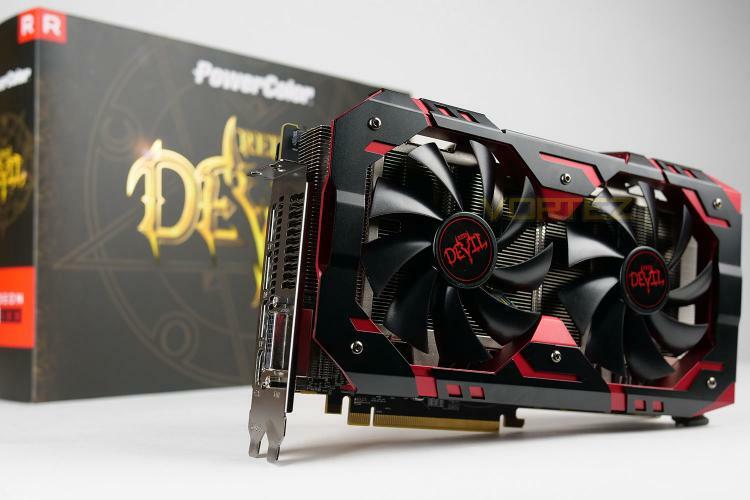 Today we have in our hands the devilish delights of the all-new Red Devil Golden Sample RX 580. The Golden Sample goes beyond what the standard Red Devil is capable of, by offering an improved cooler and higher clock speeds. Unlike previous generations of the Devil series, this RX 580 variant opts for a double-fan configuration rather than the usual triple-fan – but instead we get two, larger 100mm dual ball bearing fans which promise to deliver on performance and low-noise. Both PowerColor Red Devil Golden Sample RX 580 and Red Devil RX 580 utilize 8GB of GDDR5 memory with 2304 stream processors and have 2000MHz memory clock speed which is connected via a new high speed 256-bit memory interface. They have the capability to switch from Ultra Overclocking to Silent Overclocking or vice versa for choosing the BIOS fitting your need, faster clocks or more balanced overclock with quiet operation. On the OC BIOS, Red Devil Golden Sample RX 580 ships with 1425Mhz core clock speed and on the other hand Red Devil RX 580’s core clock speed is 1380Mhz. On the Silent BIOS, Red Devil Golden Sample RX580’s core clock is 1411Mhz and Red Devil RX580 is 1355Mhz.